We all utilize doors and locks on such a regular basis it comes to no real surprise that we easily take them for granted. When you realize that a door or a door lock that you depend on isn’t functioning properly, it can quickly become a scary situation, especially if it is the front door hardware. Is your door not properly sitting in the frame, unable to be completely fastened shut? 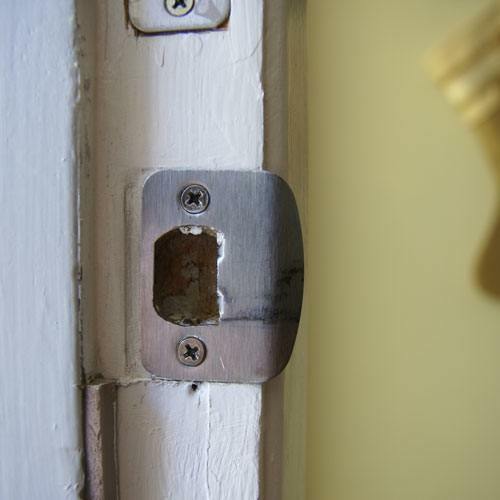 This often represents an issue with your strike plate which is related to the front door hardware of your home. In order for a door to fully latch close, a door strike must be able to spring inside of the rectangular recess of the strike plate correctly. In order to fix the problem what needs to happen is a slight adjustment of the door strike and some additional lubrication. When you walk by you doorway does your door appear to look askew? If your door is sagging or hanging awkwardly it will cause the door strike which is part of front door hardware to hit the strike plate at the wrong angle. 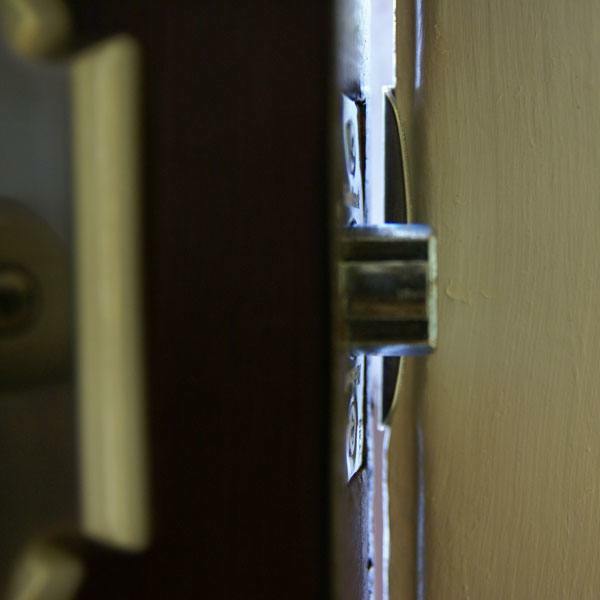 This causes the door strike to not spring into place, leaving your door open for intruders. Oftentimes this calls for an adjustment of one or a few of the hinges. If this is an interior door it is still important to have it repaired because an improperly aligned door can cause damage to the locking mechanism of the door as well. Is your door just randomly having issues with staying closed? If you look at the door and can tell that it is in correct alignment with the frame and nicely fastened to the hinges then perhaps there is a very small issue with the front door hardware such as the strike. What you need to do is use your finger to depress the strike and then release it. Normally, a strike is going to bounce back up once your finger is gone. If the strike you touched stuck after you depressed it, then it is necessary to lubricate the door strike by spraying a silicone based lubricant inside. Now in a different scenario, if you depressed the door strike and it popped out easily then here is another experiment to attempt. Try closing the door while using some extra force and then examine whether or not the front door hardware such as the strike has finally latched correctly. If this is the case, a very slight strike adjustment will fix everything. Another problem that you may run into is that the front door hardware such as the knob becomes difficult to turn. There may be a slight break on your key or your lock may not be working properly. A splash of lubricant into the locking mechanism where you insert your key may fix the situation. If the lock is still having issues it may be necessary to call upon a residential locksmith in Reno NV to discover the problem and fully repair it. For the most part, doors are a simple device. But the front door hardware that fastens your door and keeps it secure is important. If door or lock hardware is improperly installed or not correctly functioning, then one should call a locksmith Reno NV company to ensure the security of your home. This entry was posted in Locksmith Tips and tagged door, door lock, expert locksmith, front door hardware, locksmith, locksmith reno, reno, reno locksmith, strike, strike plate. Bookmark the permalink.